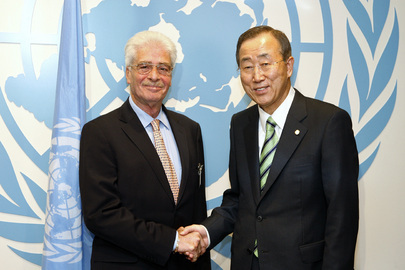 UNITED NATIONS, April 21 -- The expectation was of volcanic ash when the two heads of the International Civilian Aviation Organization arranged to speak to the Press on Tuesday. They had come to the UN to meet with Ban Ki-moon, amid ash-trigger flight cancellations which even killed off the UN Security Council's long planned trip to the Congo to try to save its peacekeeping mission. But after meeting Ban, they claimed that ash was not among the three main issues discussed: climate change, security against terrorism, and the reconstruction of Haiti. Inner City Press asked, about criticism of ICAOs lack of leadership during the six days of flight cancellations. It is up to member states to decide when to close their air space, was the answer. But shouldn't ICAO develop standards, for the effects of ash concentration? It is not easy, the president off ICAO's Council Roberto Kobeh Gonzalez said. Inner City Press asked about the decision by the European Union to block -- "blacklist" -- all aircraft from 13 African nations, as well as about the U.S. decisions after the so-called Nigerian underwear bomber. Raymond Benjamin, ICAO Secretary General, tried to chide Inner City Press for mixing the two issues, and said that the U.S. blockages have all been resolved. But what about the EU blacklist? When Pressed, the two men insisted that their only focus was safety. But when Inner City Press asked for their response to many letters asking that ICAO let in Taiwan -- province of China! -- at least as an observer, given the number of flights in and out of Taipei, they shook their heads. So are the letters a waste of time? Yes they are, was the answer from Raymond Benjamin, ICAO Secretary General. Video here. Only at the UN. Leaving the stakeout, one correspondent muttered, "What ashes." UNITED NATIONS, April 16 -- The UN Security Council's trip to Africa, already shortened and devalued, has now been canceled in full, French Ambassador Gerard Araud told Inner City Press on Friday morning. The rationale, he said, is the Iceland volcano which makes the Council's flight to Paris and then Kinshasa unpredictable. The trip was supposed to be for a week, Friday to Friday. Then once at least three Permanent Five members including the U.S.'s Susan Rice said they were not going, it was shortened to Friday to Tuesday, with side trips to Rwanda and Uganda -- about the Lord's Resistance Army -- cut off. Some said that was to lure Ms. Rice back onto the trip. But if so, it was unsuccessful. Now, as airline delays spread after the volcano's eruption, the already embarrassing trip has been canceled. One diplomat who had been slated to go told Inner City Press, "This makes it more difficult to extend the MONUC mission, we cannot convey the message to [DRC President Joseph] Kabila." With another perspective, as usual, South Africa's Dumisani Kumalo quipped to Inner City Press, "Thank God they're not going to the Congo." 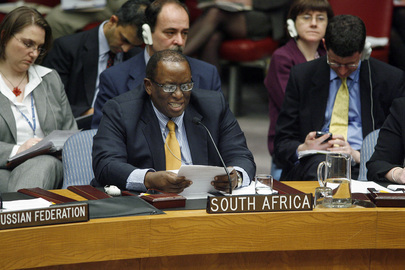 Kumalo, previously South Africa's Ambassador to the UN, now works on Great Lakes issues. He is less than impressed with the Council's and the West's work in the Congo. He told Inner City Press he had heard of the Alan Doss nepotism scandal. Click here for that. And watch this site.